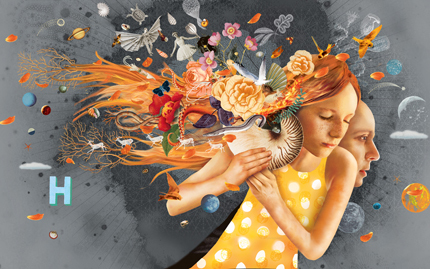 Annas himmel (2013) by Stian Hole, one of the illustrators in The picture book in new guises. An interesting exhibition is going on at the Nordic Watercolour Museum in Skärhamn, Sweden. The picture book in new guises is the museum’s fourth exhibition under the theme of exploring the potential of pictorial storytelling. Original illustrations from books published in the past year by 12 young Nordic illustrators are exhibited. 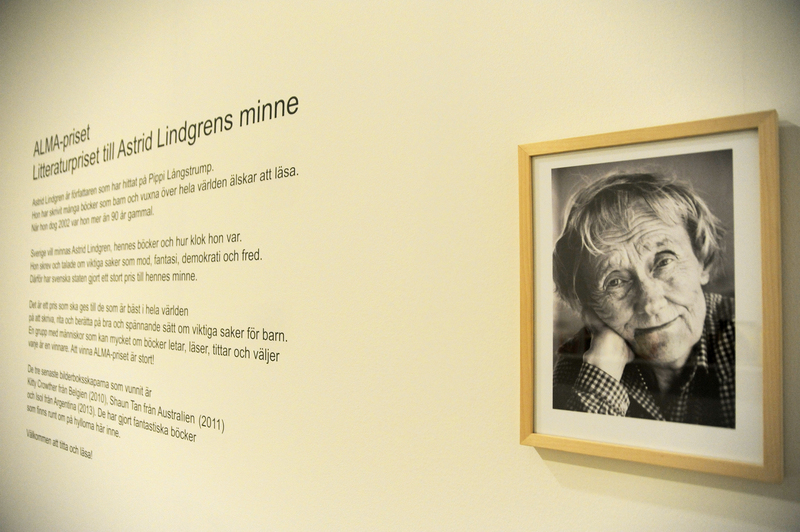 The museum also presents the Astrid Lindgren Memorial Award. 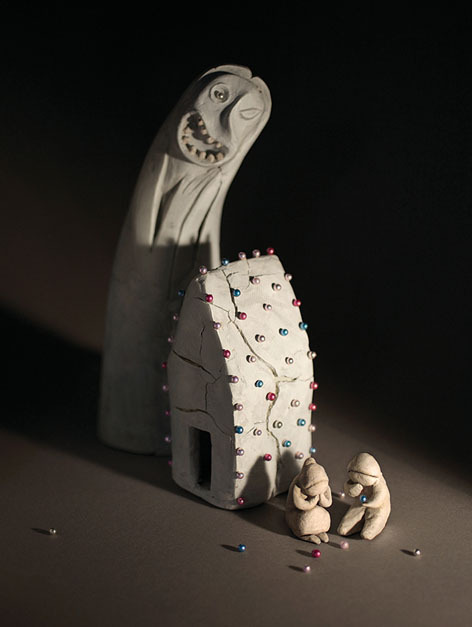 As part of the pictorial storytelling theme, the museum has also chosen to present three ALMA laureates – Kitty Crowther, Shaun Tan and Isol. 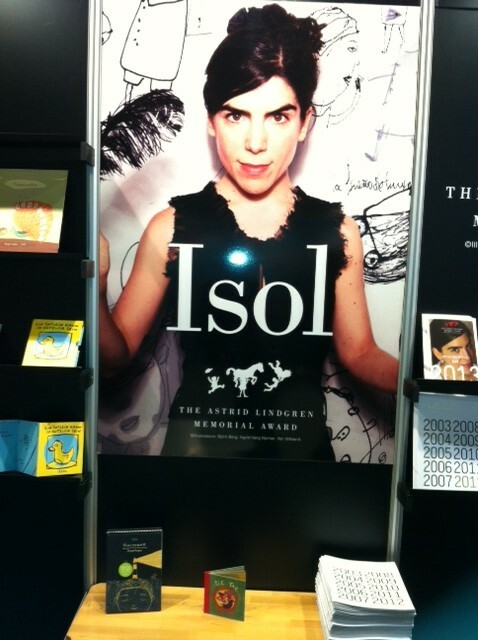 Among the exhibits are the original illustrations to Isol’s Tic Tac (text by Jorge Luján and illustrations by Isol). The big draw. 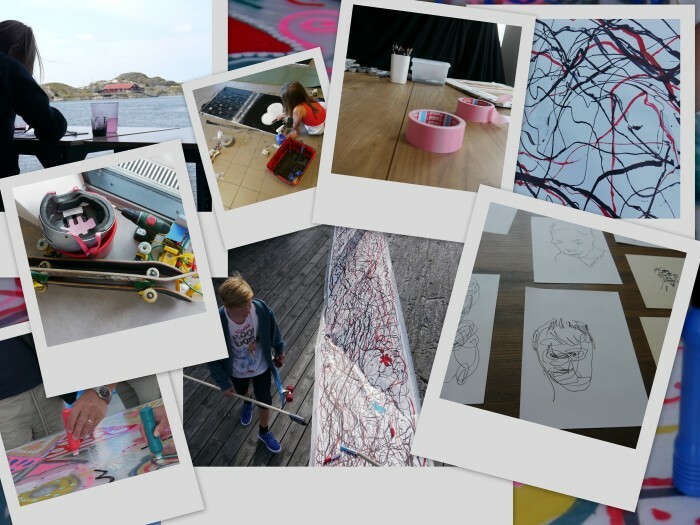 A large drawing party with a variety of open workshops led by artists, which will take place next week at the Nordic Watercolour Museum. The museum also presents an extensive program during the autumn. 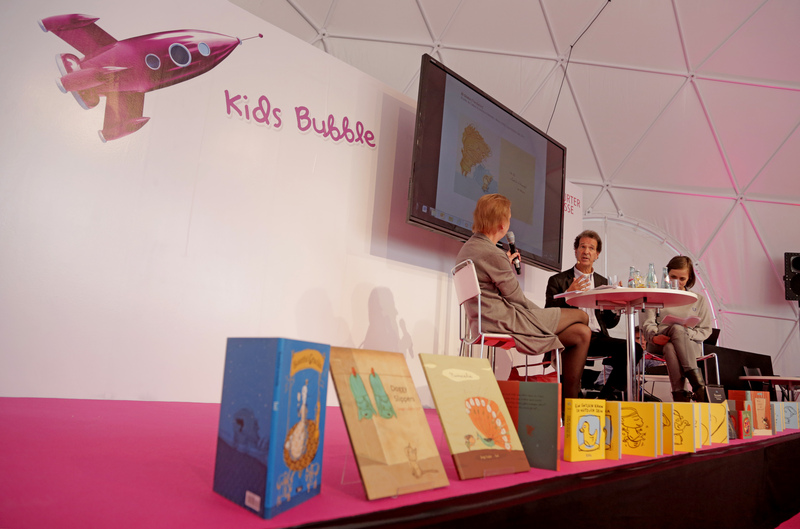 On Nov 8 there´s an open seminar and launch of the book A fanfare for the picture book (our transl. En fanfar för bilderboken), a tribute to the picture book as medium containing articles that examines and celebrates the picture book as a unique medium and an art form in itself. Among the speakers are researcher and ALMA jury member Ulla Rhedin and the 2010 ALMA laureate Kitty Crowther. The exhibition is available until February 16, 2014. ‘Godfather Death’ Paper, clay, paint, approx 25cm tall. A masterly visual storyteller. These words are part of the quotation of the ALMA jury for the 2011 laureate, author and illustrator Shaun Tan. 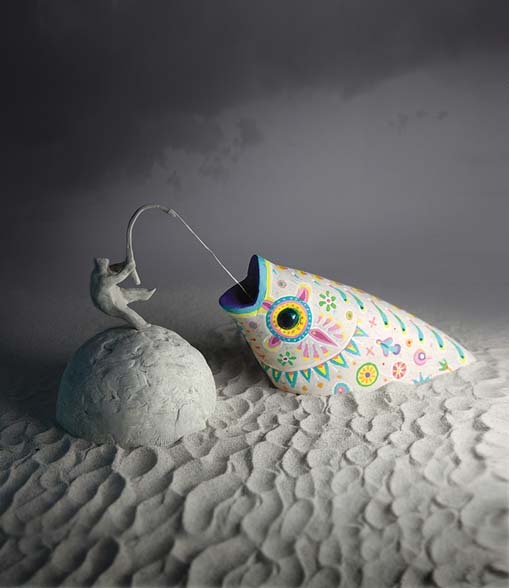 His book Rules of Summer (Hachette, 2013) will be published shortly, but there´s yet another reason to put Shaun Tan in the limelight today, and that’s the release of a book written by another ALMA laureate, Philip Pullman (who received the award in 2005). 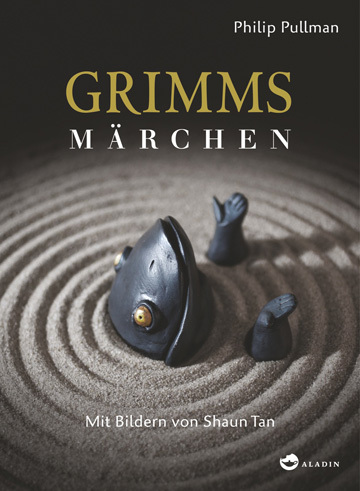 In Fairy Tales From the Brothers Grimm (Penguin Books, 2012), Pullman retells his fifty favorites, paying homage to the tales that inspired his unique creative vision—and that continue to cast their spell on the Western imagination. 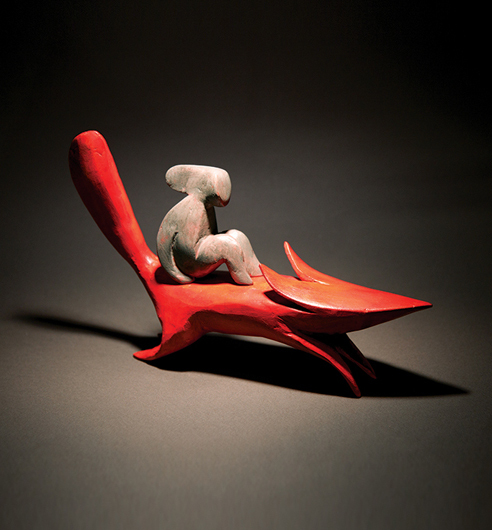 As a child, I was actually more obsessed with sculpture than painting and drawing, working with clay, papier mache and soapstone, and was reminded of this when browsing through my collection of books on folk art and particularly Inuit scultpure and Pre-Columbian figurines from Mexico. 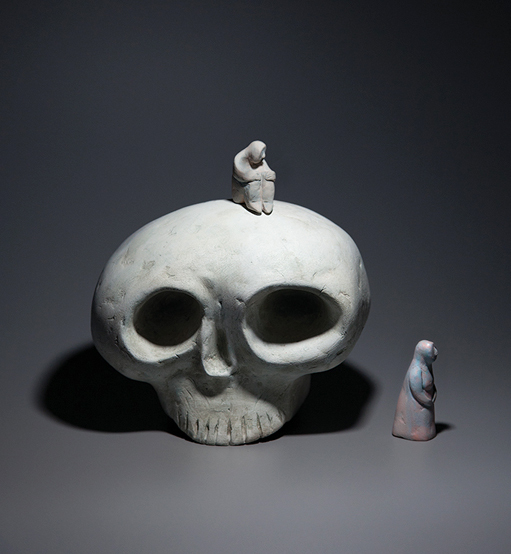 Many of these small, hand-sized sculptures are strongly narrative and dreamlike, and offered a ‘way in’ to thinking about Grimm’s stories as part of an old creative tradition. The works I ended up creating hopefully convey the spirit of each tale without actually illustrating them, like anonymous artifacts in a museum open to all kinds of interpretation. ‘Hansel and Gretel’ Paper, clay, paint, wax and cake decorations, approx 25cm tall. ‘The Golden Bird’ Paper, clay, paint, paint, shoepolish, approx 20cm tall. ‘The Fisherman’s Wife’ Paper, clay, paint, string, sand, approx 20cm tall. 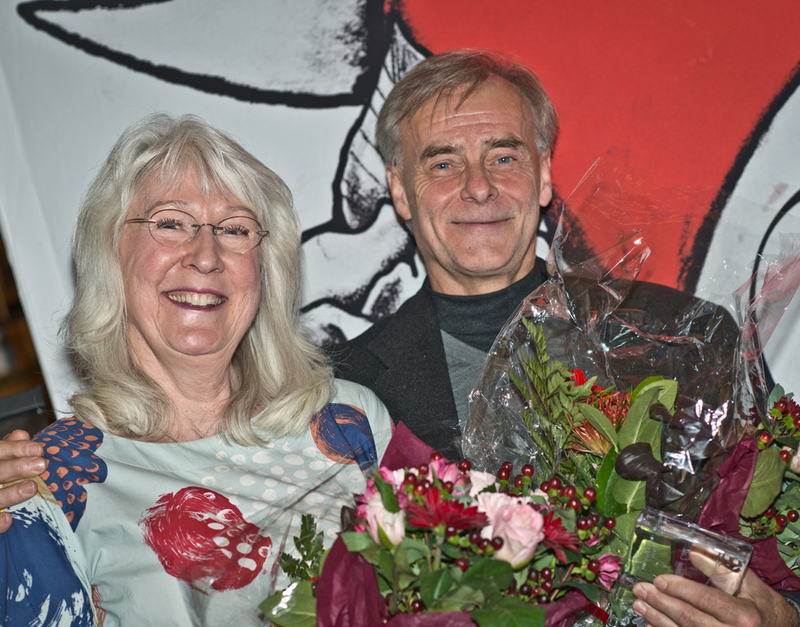 Happy recipients of the Linné-plaque; Maj Fagerberg (illustrator) and Stefan Casta (author). Photo: Lena Dahlström. Last Thursday author and jury member Stefan Casta received the Carl von Linné-plaque at Stockholm City Library for his book The Bumble-Bee´s Herbarium (our translation, Humlans Herbarium, illustrations by Maj Fagerberg), a non-fiction book for children. The Linné-plaque is awarded annually by the Swedish Library Association to the best non-fiction book for children and young adults, and the award amounts to 25 000 SEK. Another book by Stefan Casta, The House Where the Bumble-Bees live (our transl.) 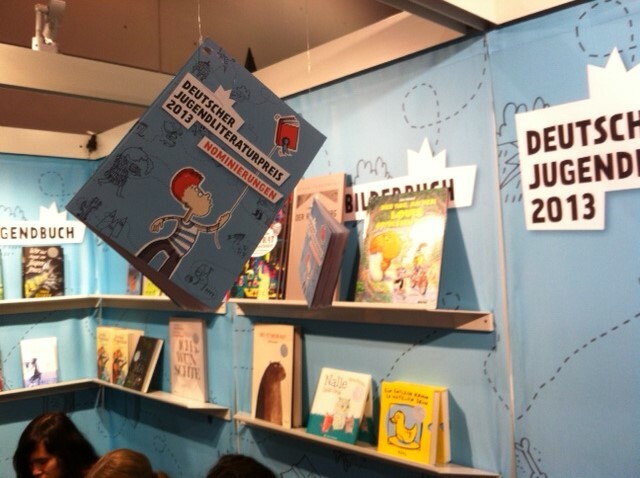 is the Swedish contribution to the IBBY Honour List. More about honour list here. More about Stefan here (in Swedish). 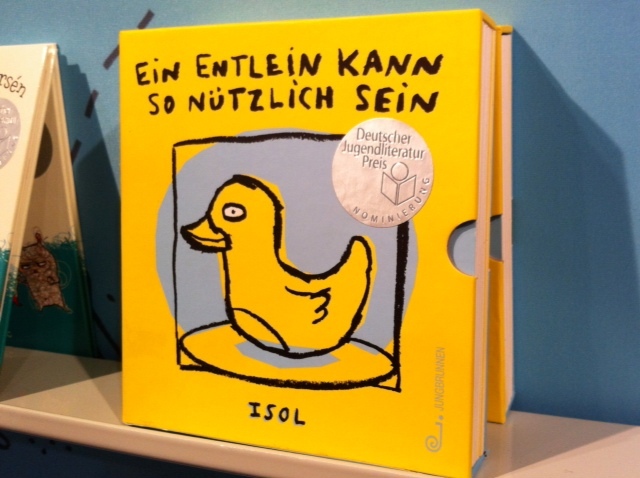 Ein Entlein kann so nützlich sein (the German edition of Tener un patito…) is nominated for Deutscher Jugendliteraturpreis (the German Children’s Literature Award) in the category for picturebooks. 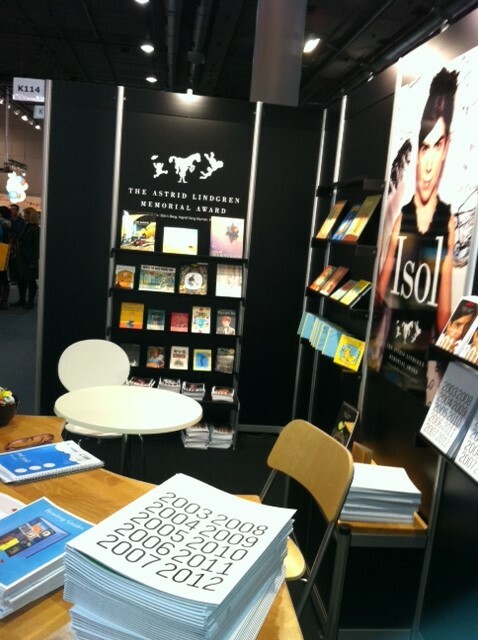 Since they are our neighbours at the Frankfurt Book Fair, it’s impossible not to notice Isol’s books if passing by our corner of the fair. The winners are announced later today. 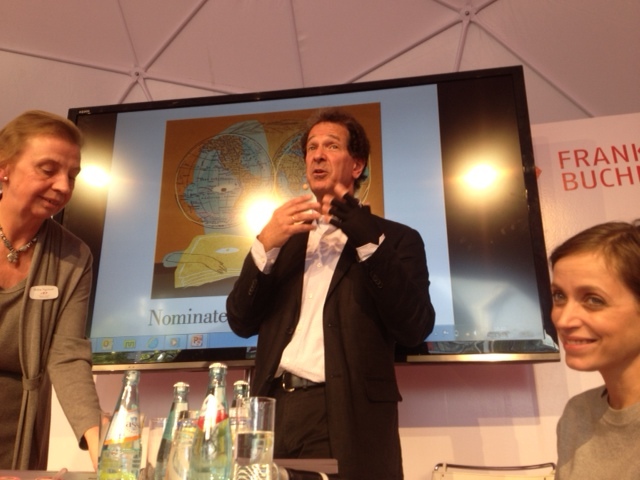 During ALMA’s programme at the fair yesterday, not only the candidates for the 2014 award were presented. A presentation of Isol’s work was made, and Larry Lempert and Helen Sigeland also talked about the working year of ALMA. Moderator for the whole thing was actress Anna Thalbach. Finally at Frankfurt Book Fair! 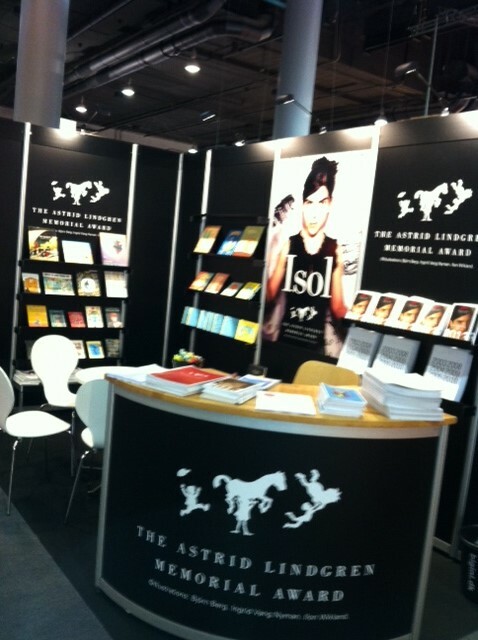 Meet us here, at the Frankfurt Book Fair! We are ready for many interesting meetings, people and events, and not the lease the big day tomorrow, when the nominated candidates for 2014 are presented. Visit us in Hall 3.0 K114! There is a murmur through the room. The lights have just been turned off and a new image emerges, glows from the book that lies in front of 22 eight-year-olds. 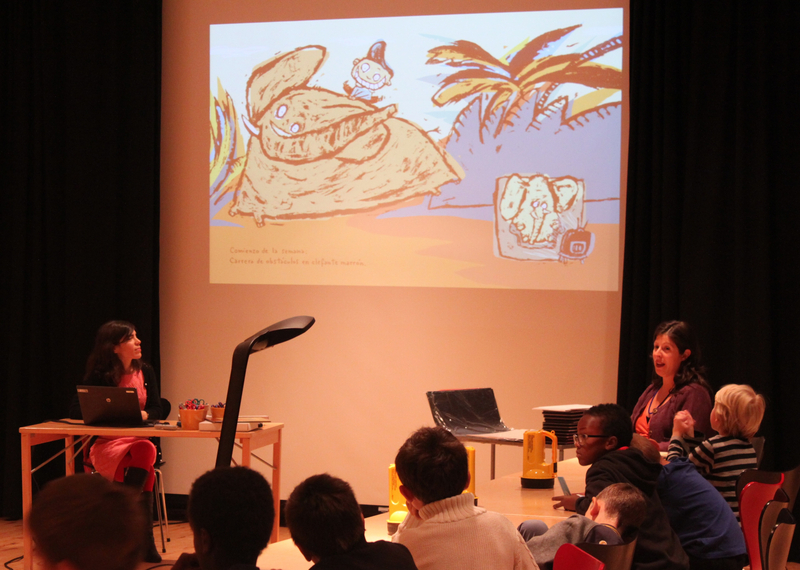 This year’s laureate of the Astrid Lindgren Memorial Award, Isol, is showing illustrations and talking about her books. She has just demonstrated how the children can unleash their imagination and create fun and unexpected things with drawings. She asks the children to suggest a number that she then draws on a whiteboard. And she draws another one. And another. Isol twists and turns the numbers without any apparent order. And suddenly, the numbers have become a funny figure! With pen and paper, scissors and crayons, anything is possible. 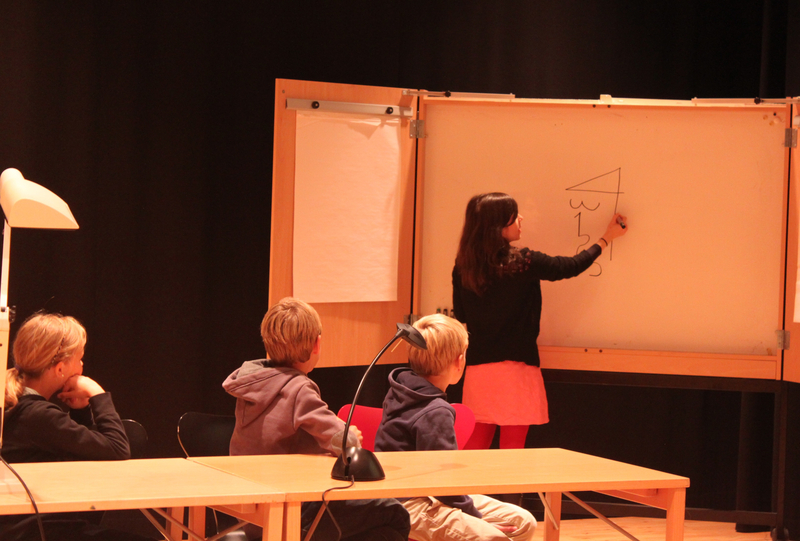 The children in the primary school Flatåsskolan in Gothenburg have already read Petit, the Monster and Numeralia and talked about Isol, Astrid Lindgren and the Astrid Lindgren Memorial Award. And now she actually stands here, in front of the children, at the Frölunda Cultural Centre. The children live nearby, in a suburb of Gothenburg, but many of them have roots far away in other parts of the world. — My mother is from Brazil, one boy says. Isol speaks English with the children and many of them answer her with a good command of English. Sometimes she speaks Spanish and then America Vera-Zavala translates. Isol shows images from her latest book, Nocturne – Dream Recipes, to be published in Swedish in January 2014. Copies of the book are handed out to the children and they start working in pairs. On every page of the book there is a plain ink drawing. 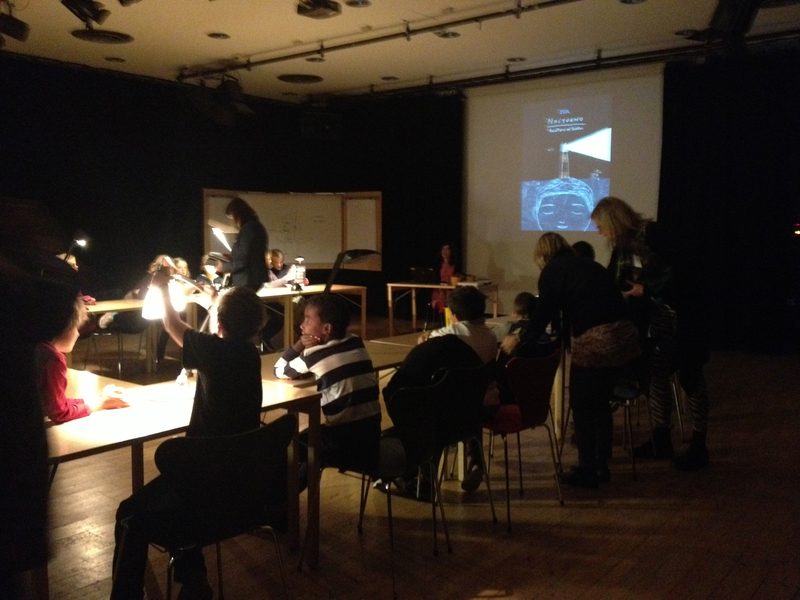 Then the light in the roof is turned off and each book is illuminated by a desk lamp or a flashlight. The excitement trembles in the air. The children count to 30. Then all lights are turned off. Now another fantastic image appears, that glows greenish yellow in the dark. An image of a dream! — Now you shall make your own dreams, Isol says. Draw what you like. Paper, pencils and crayons are distributed. Hearts, houses, lightning, cars and exciting shapes are emerging. The children cut them out and put the pictures on the last page, which is white and empty. Then all the lights are turned on over the books. — This time we count to 50, Isol says. The “aaah” is more overwhelming this time. The children quiver with joy to see the results of their own creations. And then the illustrations slowly fade away. They immediately start with their next picture. They draw, change and start all over again. 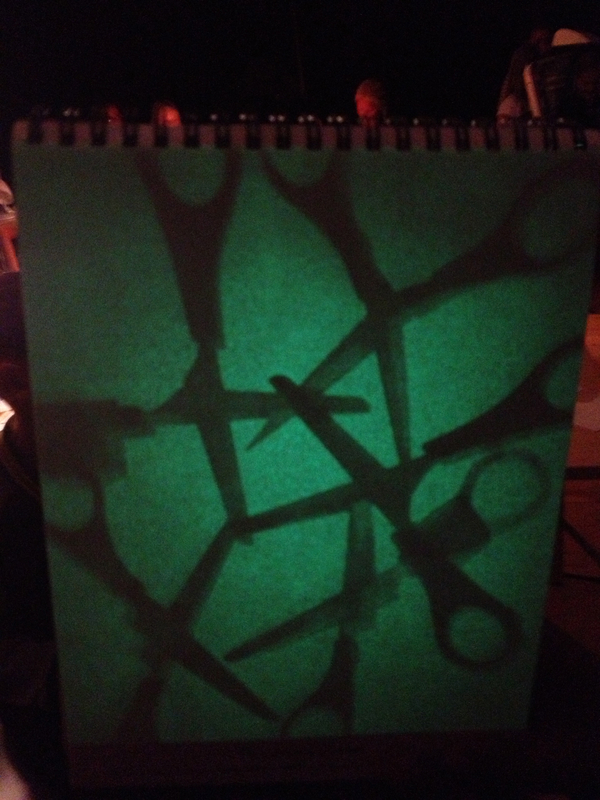 They put pens and scissors in patterns and are surprised by the results. Finally, the lesson is over. The children want to continue and are disappointed when they are told to finish, but soon forget the disappointment when librarian Anna Carin Svedstam at Frölunda Library inform them that they are actually allowed to bring the books home. 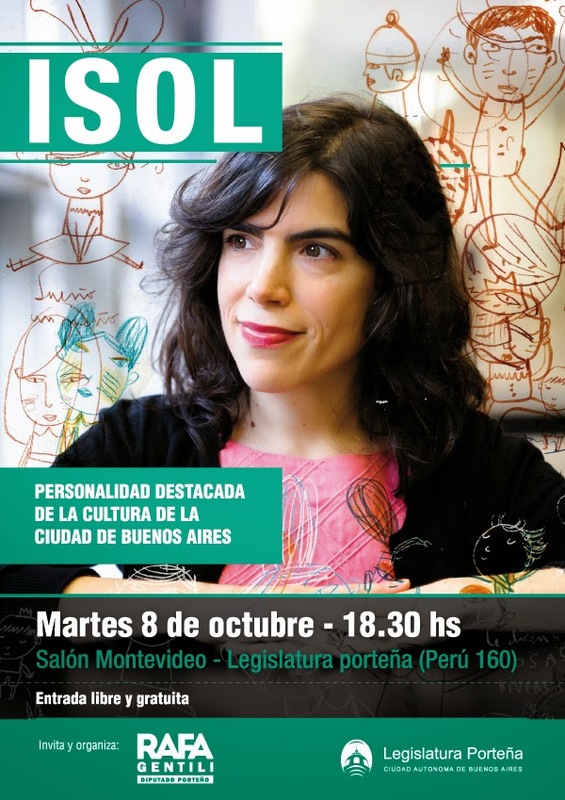 Isol has been honoured by her home town Buenos Aires for her prominent cultural achievements. In a comment, initiator and member Rafael Gentili says he wants more recognition for illustrators and musicians, and also an improvement of their rights. A ceremony will be held next Tuesday in the town hall.